Also called sequencers, D.A.W.s are the heart of computer-assisted music configurations. A DAW is nothing else than a very sophisticated software version of a tape recorder. It's a multi-track recorder, allowing you to work with audio as well as MIDI data used by virtual instruments. 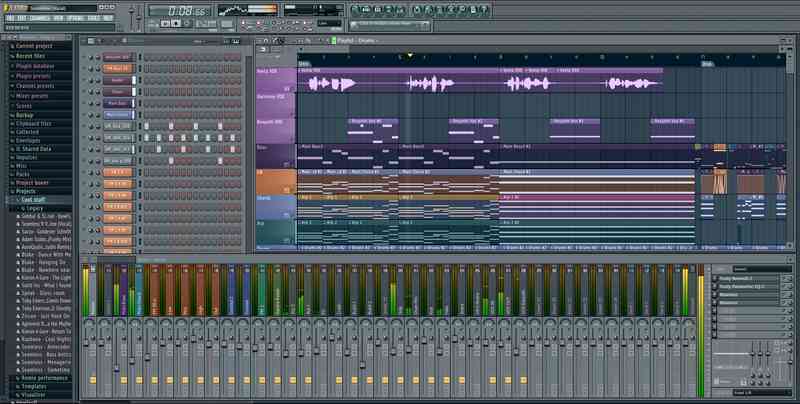 There are many different DAWs, more or less expensive, more or less complex, some are more audio or MIDI oriented and all users have their favorite DAWs. Ask 10 musicians what DAW they like best, and you may well get 10 different answers. Unless you have the opportunity to try several of them in order to compare and make up your mind, you will need to get information, get some feedback from users on the Internet or anywhere else, and once you start using a DAW, you usually stick with it for quite some time. So what is the best DAW? The best DAW is the one you are used to using, the one you are confident with, the one that allows you to reach your purpose with the less efforts. This list is not exhaustive, there are other DAWs. You will have to find the one that suits you best! Please note that most DAWs come in different versions, with more or less features, included plugins, with prices that should match everyone's needs. 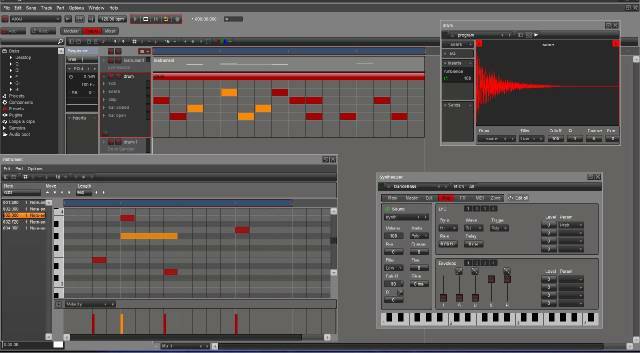 Sonar has been my DAW of choice since version 5 from late 2005. 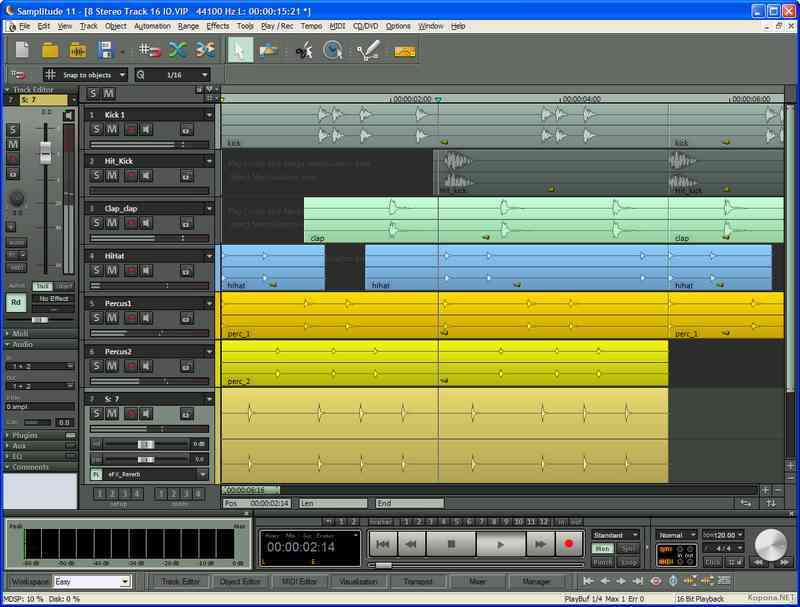 I tried other DAWs, but I remained loyal to Sonar, because I find it simple to use and extremely complete. It comes with a lot of various plugins, so you don't have to buy anything else, unless you have specific needs. 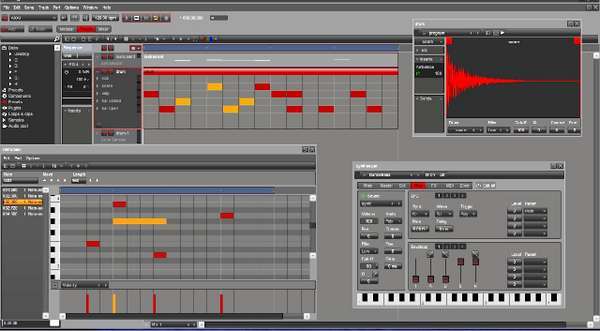 The latest version includes several synths, like Rapture or Dimension Pro, which embarks many different sounds, including a classical orchestra, plus the sounds you can create yourself. Sonar also comes with True Pianos, a very good piano simulator, as well as XNL Audio Addictive Drums, a pretty effective virtual drum plugin, Melodyne Essential, a pitch editor designed for arranging and correcting vocals. There's also a limited version of Overloud TH2, an excellent guitar amp simulator. Many other plugins are included (EQs, compressors, reverbs, delays, etc. ), so you can use Sonar immediately, without having to buy anything else. It's probably the DAW that comes with the most plugins, at least in its Producer version. There are 32 and 64 bits versions so it will adapt to your Windows configuration. If I had to find drawbacks, I would say that it's only available for Windows (no Mac version). Reaper is a very interesting piece of software: it is very complete and allows you to do what the other major DAWs can do, it has a powerful and efficient in/out routing system, its interface can be fully customized, it is updated on a regular basis and it is much cheaper than its competitors. 60 dollars/45 euros for a full DAW, to be compared to about 400 euros for the other major DAWs in their full version. Of course, Reaper is not perfect, but you can do everything with it. It's also a question of habit. I'm used to Sonar, and I don't want to change and learn what I already know all over again with a new DAW. But I had the opportunity to use Reaper occasionally, and if I had to start using a DAW from scratch, I would choose Reaper. It's available for Windows, Wine and Mac OS X, and compatible with VST, VSTi, DX, DXi and AU plugins. Reaper can be downloaded and is fully and freely usable without time limit. Yet, it is a commercial product, and it is your moral duty to pay for it if you use it regularly. Its price/quality ratio is unbeatable, so the expense is justified. Cubase is a D.A.W. 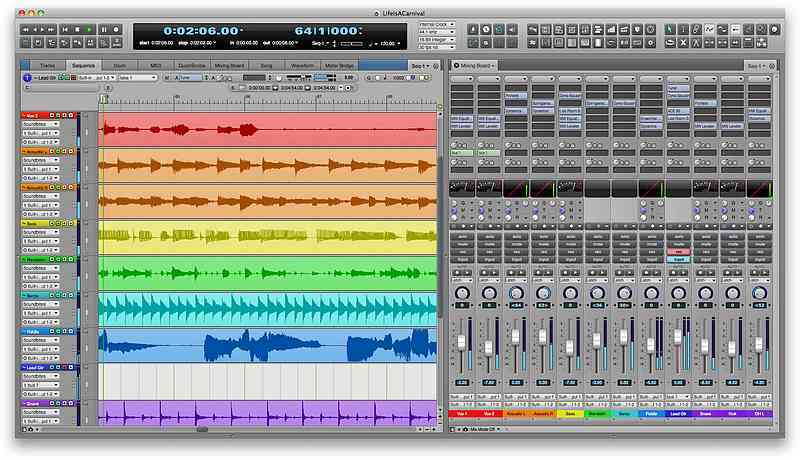 from Steinberg, designed for recording, editing and arranging music. 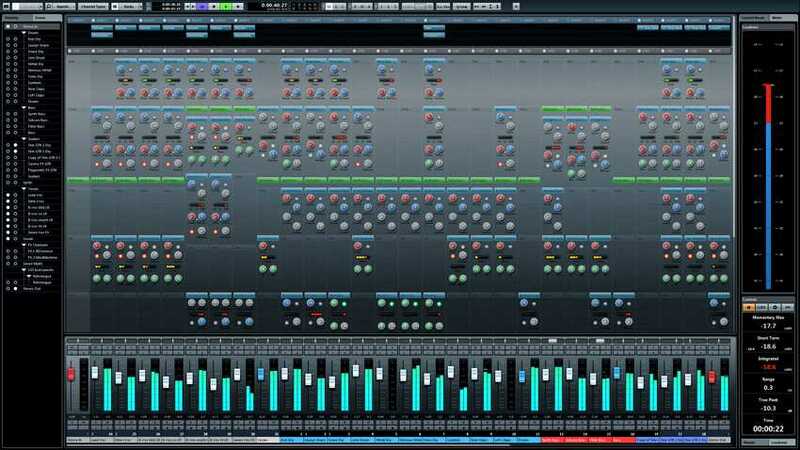 Cubase 7 is the latest version. 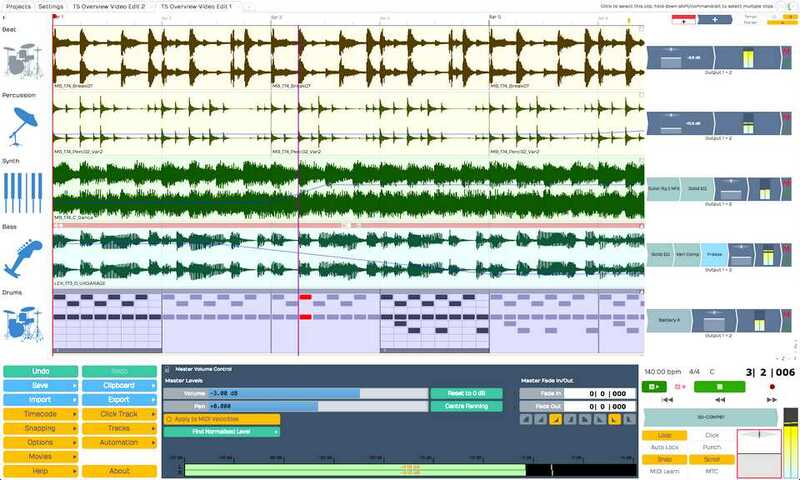 It includes among other things: a virtual drum, a vocal editor with real-time tone correction, VST expression tools to easily edit instrument articulations, enhanced data automation and handling, and a convolution reverb plugin. 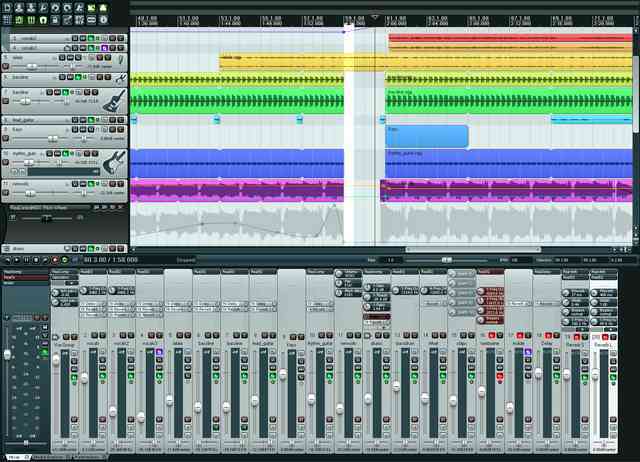 Cubase supports Windows Vista and Windows 7 64-bit technology. Studio One is a rather recent DAW from PreSonus, which also makes audio interfaces, pre-amplifiers and mixing consoles. Although PreSonus is mostly a brand specialized in hardware, Studio One is a good alternative to other DAWs. Studio One originally comes from the free DAW Kristal, which is now abandoned. Studio One has very good ergonomics, it includes Melodyne, a plugin that allows you to edit audio very simply (to change pitch, or make a tempo change). On the other hand, it doesn't include a score editor and comes with few virtual instruments. 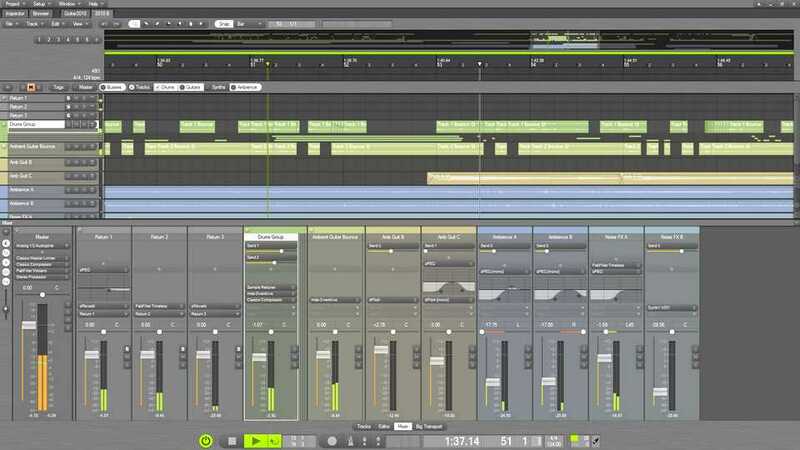 There are several versions of Studio One, more or less complete, and there is also a free version, not limited in time. The problem is that this free version is not compatible with plugins (VST or others), so the interest is limited. Yet, it's a good opportunity to try a DAW and see if you like it. 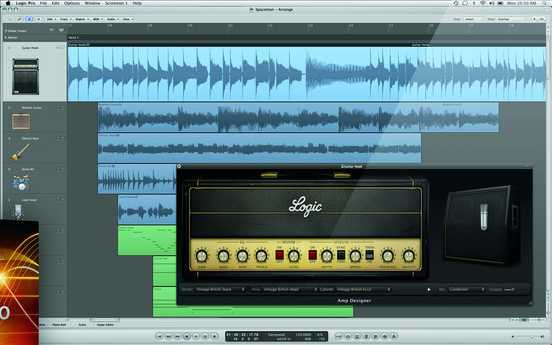 Logic Pro is a 32/64 bit audio and midi D.A.W. for Mac OS X. it is part of Apple's profesional music software range. A light version, Logic Express with the same interface and the same audio engine but less options is also available at a lower price. Pro Tools is widely used by professionals throughout the audio industries for recording and editing in music production, film scoring, film and television post production. 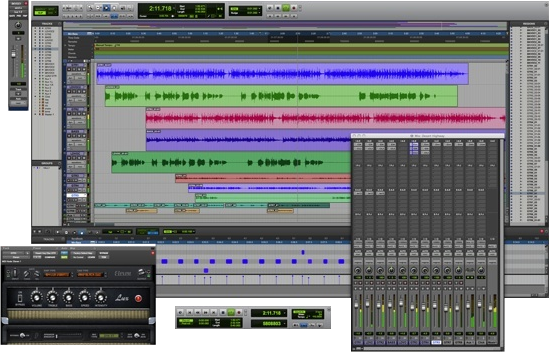 Pro Tools has three types of systems; HD, LE, and M-powered. HD is the high-end package and is an integration of hardware and software. The hardware includes an external A/D converter and internal PCI or PCIe audio cards with onboard DSP. 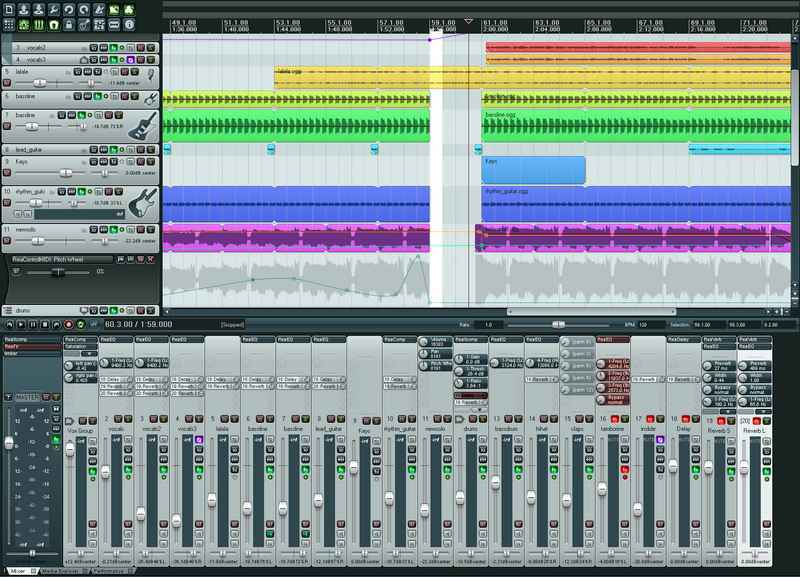 Fundamentally, Pro Tools, like all Digital Audio Workstation software, is similar to a multi-track tape recorder and mixer, with additional features that can only be performed in the digital domain. The high-end version supports sample rates of up to 192 kHz and bit depths of 16 and 24 bit, opens WAV, AIFF, mp3, SDII audio files and QuickTime video files. It features time code, tempo maps, automation and surround sound capabilities. 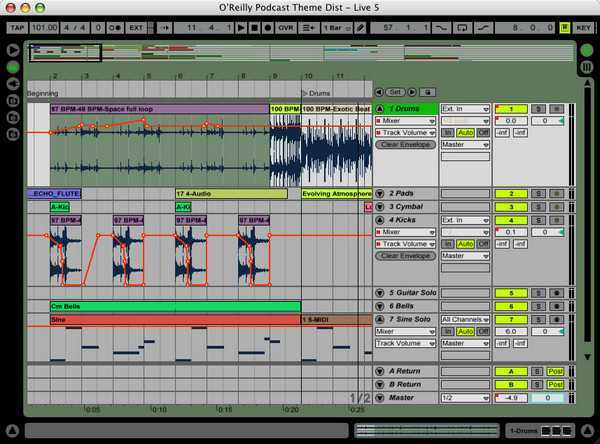 Ableton Live is a loop-based software music sequencer and DAW for Mac OS and Windows by Ableton. Live is a tool made for composing and arrangements, but its design and ergonomics are mostly live-oriented. The user interface was optimized for live performances. It is reduced to a minimum and is easily usable on a one-screen configuration. The absence of pop-up windows, its unique window divided into 5 categories makes it easy to use on laptop computers that may not be as powerful as their desktop counterparts. The different categories may be hidden or displayed with a simple click on the corresponding icon. The layout is then reorganized depending on the active categories. For live performances, you can display the loop points or the starting point of one or more clips, and they will remain in tempo with one another ("warp" feature you can trigger on the fly). Acid comes in 2 ranges: Pro and Music Studio. The pro range has more features. Acid Music Studio costs about 50 euros, and the pro version about 150 euros. Available for Mac first and now for Windows, Digital Performer includes many high-quality effects and an excellent score editor. Virtual instruments on the other hand are not numerous. 30-day limited demo versions are available on the official website if you want to give it a try. This software is the descendant of Fruity Loops, which was perfectly suited for Electro or Hip Hop music. Nowadays, FL Studio makes it possible to record any genre, but the way it works makes it still not really suited for acoustic musics. It is based on a concept of patterns added to a playlist. 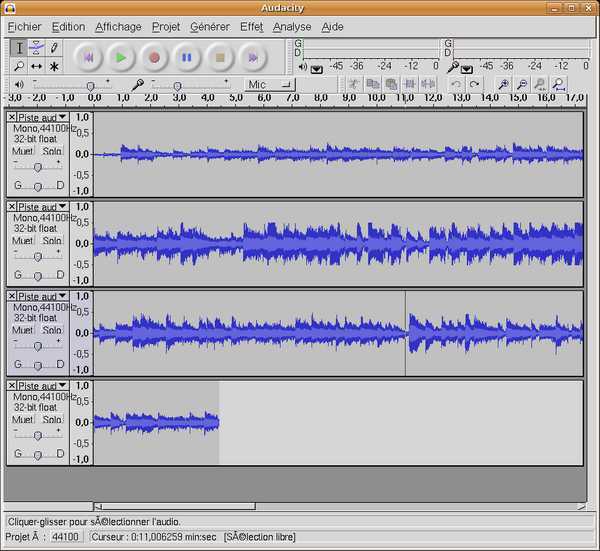 It used to be dedicated to MIDI recordings, but Reason now handles audio. Still, for historical reasons, many Propellerhead Reason users still produce electronic music. 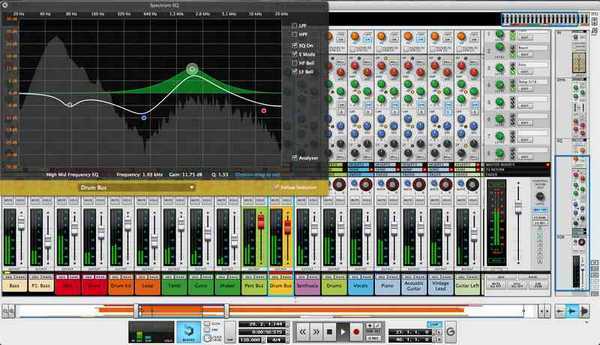 Reason has a very powerful routing system, through the used of virtual cables, which could discourage some people. 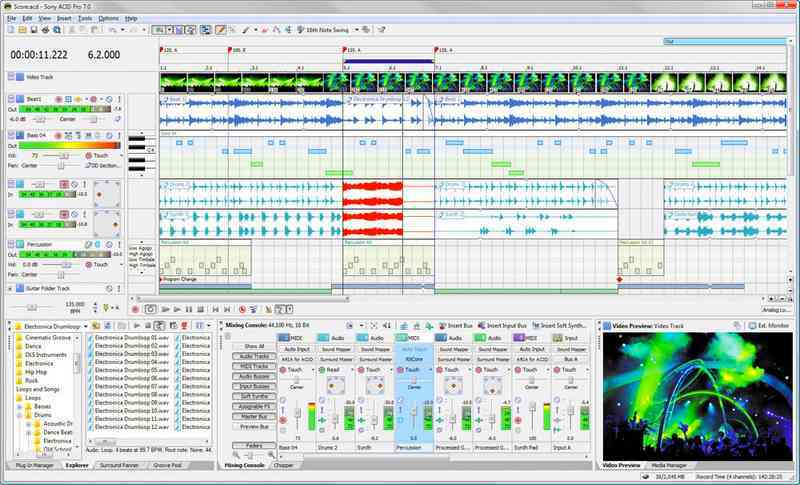 Unlike Reason, Samplitude was long limitied to audio management, and could not handle MIDI data. It's no longer the case. Samplitude is based on the concept of audio objects, where each audio clip has its own routing and automation capabilities. Samplitude includes many effects plugins and virtual instruments, as well as sound banks. More technical than other DAWs, the full version is also pretty expensive. 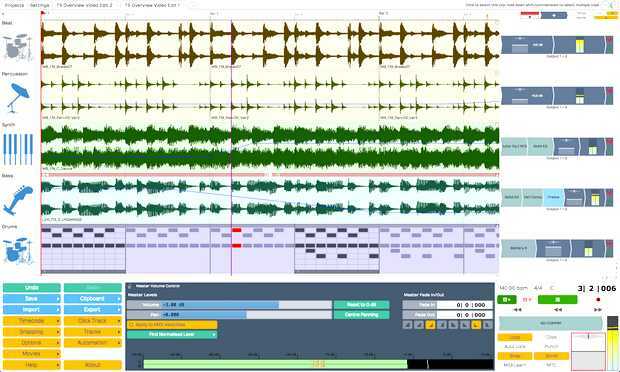 Tracktion is available for PC, Mac and Ubuntu. It costs 60 dollars for the base version, and up to 200 dollars in bundle with other in-house software (plugins and virtual instruments). That makes it one of the least expensive DAWs on the market. Users like the ergonomy of the software, but there seems to be a number of annoying bugs (rendering problems, unexpected crashes...), that will hopefully be fixed at some point. EnergyXT has been created by Jorgen Aase. EnergyXT is compatible with the VST standard, the ASIO protocol and the REX2 format from Propellerhead Software. This DAW is compatible with 16, 24 or 32 bit files, mono or stereo. The user interface is organized around a menu bar, a tool bar, tabs, a navigation window and a main window which, by default, shows the sequencer, but can also display the "Mixer" and "Modular" parts thanks to the customizable tabs. It's well suited for live performance and small configurations, with a low price of about 40 euros. It's rather simple to use but remains somewhat less powerful than more complete (and more expensive) DAWs. 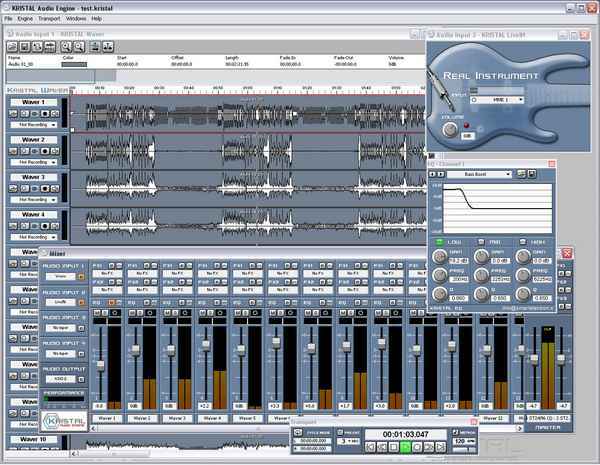 The company Zynewave has been created by Frits Nielsen, a software engineer, who developed the DAW Podium on his own. 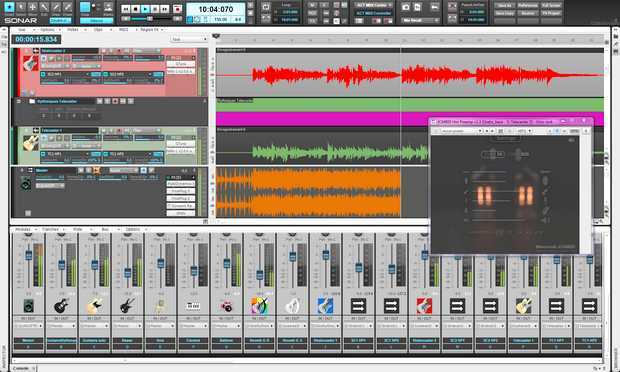 As it's a one-man company, Podium may not be as rich and complete as other major DAWs such as Sonar, Cubase or Logic, but it offers many of the features you might expect from a DAW. As a result, you may encounter compatibility issues with some hardware and plugins. Podium supports recording and editing of audio and MIDI, and hosts VST instrument and effect plugins. It is available for Windows as a 32 or 64-bit software and costs 50 dollars. You will be glad to know that a free version is available. it's adequately called Podium Free, and it has pretty much the same capabilities as the paid-for version, minus a few limitations. The most severe limitation is that the plugin multiprocessing is disabled, which means you might experience processor overloading if you use too many plugins within a project. Yet, it's worth trying, because this free version is way more powerful than other free DAWs like Kristal (obsolete in so many ways) and Audacity (really inferior to all other DAWs). Let's be honest, these free DAWs are no match for the retail DAWs. Kristal is no longer developed and updated, so it may even be incompatible with recent plugins. 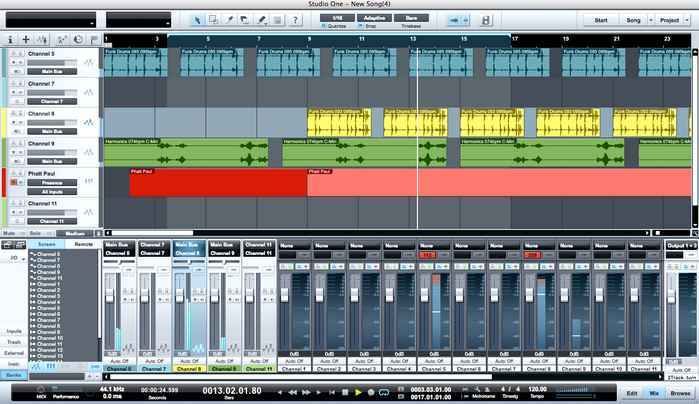 But it gave birth to Studio One, a retail DAW from PreSonus. As for Audacity, it's more an audio editor than a real DAW, even though you can use it as such, with severe limitations. You'd rather use a DAW such as Reaper, which costs only 45 euros and is way more complete and modern than those free software It's much more interesting to start using Reaper, which costs only 45 euros and is much more complet and modern than theses free software, or even the free version of Studio One, even though it's incompatible with plugins. I should also mention Podium Free, a very interesting free version of Podium (presented above) which also supports VST plugins with a few limitations. Those DAWs are way more complex (just a question of habit...) but they are the real thing and will train newcomers about the logic behind DAWs. If you get hooked, then you may choose whatever DAW suits you best. As a conclusion, free DAWs will help you out occasionally, but don't expect to make serious audio work with them in the long term. Audacity should be used as a DAW if you really don't have anything else, but it isn't up to the task and that's not its primary use anyway.